The 35th annual New Year Ultimate Fest was held January 28th and 29th, 2017 in Phoenix, AZ at Phoenix Reach 11 Sports Complex. If there is frost on the grass, please, refrain from warming up on the lined frisbee fields. Please, use the sidelines and between/behind fields. Thank you! Of note this year, the contact call rule will be used. What: a competitive game, a meetup of old friends and teammates. When: Saturday 1/28 at 5pm. 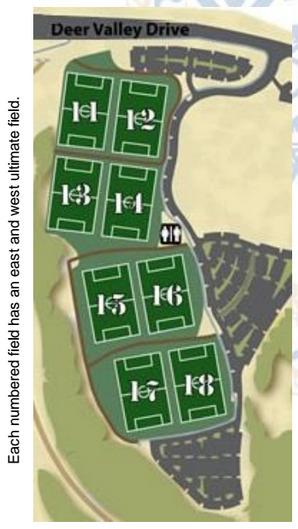 New Year Ultimate Fest 35 will be held at Phoenix Reach 11 Sports Complex. Each numbered field had an east and a west ultimate field. 21+ only. Tournament bar tab - 8pm until it runs out for anyone with a wristband that will be included in the captain's packet. There are pool tables, dart boards, arcade games, karaoke, and an outside patio area.